The apartment we stayed in was on the 2nd floor, access was via a spiral staircase so a little difficult carrying a pet carrier with our large cat inside. The area outside the apartment is pedestrian only but we were able to stop the car closeby to decant everything before driving a few streets away for parking. Marta was a great host and very helpful. There are 2 small supermarkets within walking distance which was very convenient. Fantastic place, loved it! Small but with lots of charm, with two balconies onto the back of the church. Great location. The host was very nice, even though she wasn't going to be there, she made sure that we knew exactly what to do and even stopped by to make sure we were okay. As we were arriving late, she prepared the sofa bed for us as well and even went out of her way after finishing work to help us to find a parking place. Excellent location, less than 5 min walk to the center. Good cleanliness! 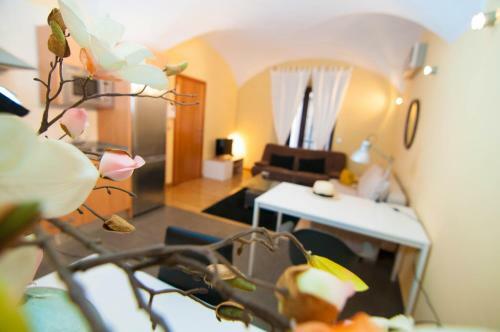 Really lovely little apartment in the old town. We were able to park on the street by the church which was a real bonus and it's less than a 5 minute walk to the main plaza. The hosts were really helpful and even provided a 2 day itinerary of things to do and see. If I go back to Caceres I will definitely stay here again. Lock in a great price for Santiago 9 Apartamentos – rated 8.5 by recent guests! One of our top picks in Cáceres.Santiago 9 Apartamentos features accommodations with a terrace and free WiFi in Cáceres, in front of San Juan Church. Accommodations is fitted with air conditioning, a fully equipped kitchen, a flat-screen TV and a private bathroom with shower. A toaster, a fridge and stovetop are also provided, as well as a coffee machine. If you would like to discover the area fishing, birding, and hiking are possible in the surroundings. Plaza Mayor Caceres is 650 feet from the apartment, while Santa María Church-Procathedral is 650 feet from the property. When would you like to stay at Santiago 9 Apartamentos? Private parking is available at a location nearby (reservation is not needed) and costs EUR 11 per day. This apartment features a microwave, toaster and air conditioning. This apartment has a stovetop, seating area and washing machine. This studio features a kitchenware, tile/marble floor and kitchenette. This apartment features private entrance and hardwood/Parquet floors. It has a washing machine, heating and air conditioning system. Guests will find a Patio. This apartment has a soundproofing, private entrance and oven. 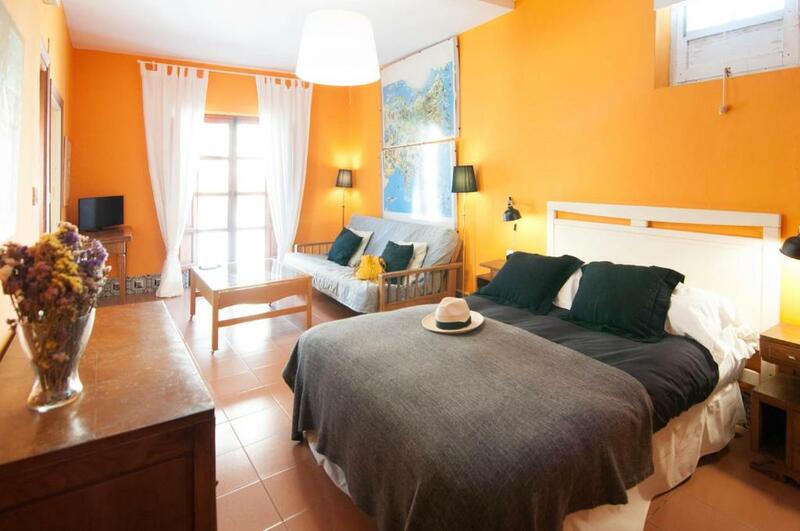 Santiago 9 Apartments are based in four beautiful restored houses of the old city of Cáceres. Located in the real centre of the city, at just 250 meters from the Plaza Mayor or the Cathedral, you will also be in the passage of the Path of Santiago through Cáceres, the way for most of the processions of the Holly Week and religious festivities, near all museums, culture and spectacles. 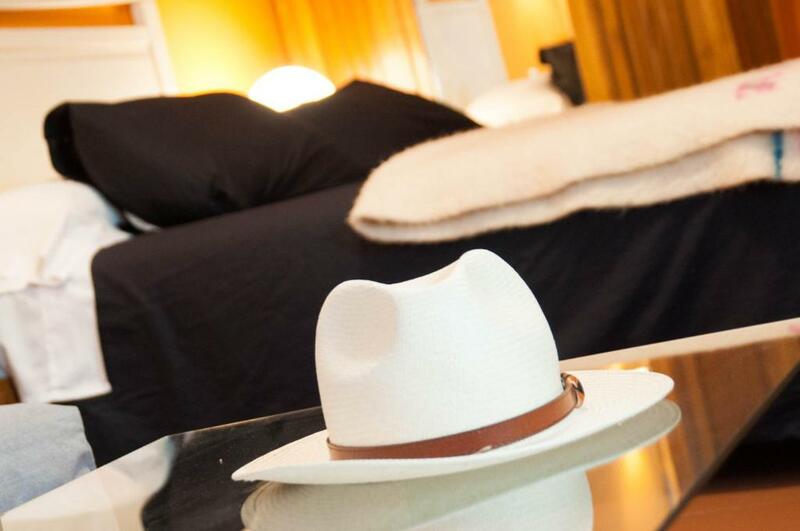 The apartments are warm, welcoming and full of chic vintage character. 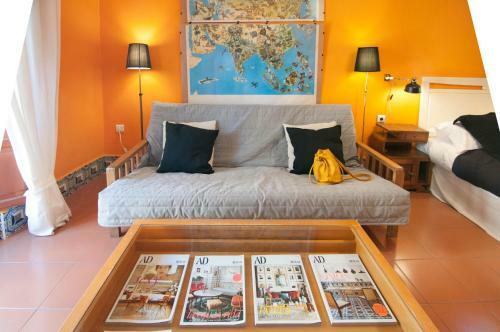 They have complete equipment: air conditioning, kitchen with refrigerator and utensils, flat screen TV, free Internet ... Private parking is available. Once you are parked, you will be able to forget your car and easily walk to most of the attractions in the city. We speak English, French Spanish and Portuguese, so communication should not not be a problem! We do love travel. That makes us know what kind of attention we would like to have from our hosts. And we do: We enjoy showing the secrets of our city, Cáceres, to our guests. We are here to bring the best attention to make your stay a great one. Located in the very historic centre, we are in a very calm and historic pedestrian area. The Plaza Mayor, the Cathedral of Santa Maria and other historical sites are at only 250 meters. The Via de la Plata and the Camino de Santiago pass front the door on their way through Cáceres. Most attractions of Cáceres are available by foot from the apartment. That means that you can forget your car once parked. House Rules Santiago 9 Apartamentos takes special requests – add in the next step! Santiago 9 Apartamentos accepts these cards and reserves the right to temporarily hold an amount prior to arrival. Please inform Santiago 9 Apartamentos of your expected arrival time in advance. You can use the Special Requests box when booking, or contact the property directly using the contact details in your confirmation. Steep steps up to first floor flat. Not a problem but tough on our old dog! Not a complaint or a dislike but the stairs to the flats on the second level are pretty steep and may not suit frail, elderly visitors. There wasn't anything to fault in our short stay. We didn't use the kitchen much so can't comment on it. Right in the center of the old town. Location was convenient to old town. Cozy rooms, perfect located in the old town, really helpful and kind hosts. Thanks for everything.